There was quite a lot of marketing for The Secret Life of Pets in Japan, and I was tempted to go, but ultimately it wasn’t a must-see, so I let it pass me by. It wasn’t even a priority film to watch on the plane – it only made it to my return journey! 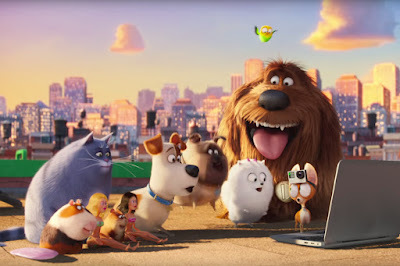 Still, it was a fun, simple animated movie that followed a formula and had some entertaining moments. The plot is more or less Toy Story with pets. When the owners are out, the pets will have fun gatherings and parties. Chubby-faced Jack Russell terrier Max loves his owner very much, though. When a big, tough, brash new dog arrives on the scene, he’s very jealous. That jealousy leads to the two getting lost together, having a lot of scrapes, meeting a lot of rejected pets and ultimately learning to love one another. Yes, the parallels to Toy Story are hard to miss. Otherwise, it hangs on its characters. Silly fluffy pom Gidget comes close to carrying the movie, by turns adorable, insane and hilarious, but the central duo are mostly on the dull side, the comedy tough-guy rabbit is an overdone joke by this stage and the funny old Pops was an enjoyable character but very one-note. The film stays entertaining but never tugs at the heartstrings or evokes more than a small chuckle. Bland, derivative and thoroughly mediocre, that doesn’t mean that it’s not a refreshing, inoffensive watch. My parents absolutely loved this movie haha (I'm kind of on the fence). I think part of its appeal is that it was so clearly written by people who have pets and who love having them. Not to mention the animation quality in certain scenes was stunning (I'm always a sucker for pretty skies). I'm actually a little surprised anyone could love it, but then I doubt many people could hate it either! It's true that it shows a lot of affection for the real pets in people's lives, and certainly there were some moments of nice eye candy. But it was very forgettable overall!